Point Lobos is one of the most imaged pieces of real estate in the world, made famous by early 1900’s painters, and then rediscovered by Edward Weston and his followers in the 70’s. Much of Weston’s most recognizable work was done in what is, after all, this tiny little stretch of convoluted coastline. When I had to be in Watsonville, just 40 miles away for several days, at the Monterey Bay Birding Festival, I made plans to spend a day at Point Lobos. Only when I got there did I realize how small it really is. I passed it going down. I was looking for this jutting cape off the coast, with miles of coastline, and I could not see anything like it on my map. I literally disbelieved my GPS when it said the little gate in the patch of forest was the entrance, and drove on down the coast highway into the Bir Sur country looking for the real Point Lobos. Of course, once inside the preserve, I realized that Weston’s miles of coastline are just folded up tight into the small acreage of the surface park. I spent the morning there and I have posted a somewhat more lengthy version of the experience at Point Lobos Morning on Point and Shoot Landscape. This image is one of my favorites. 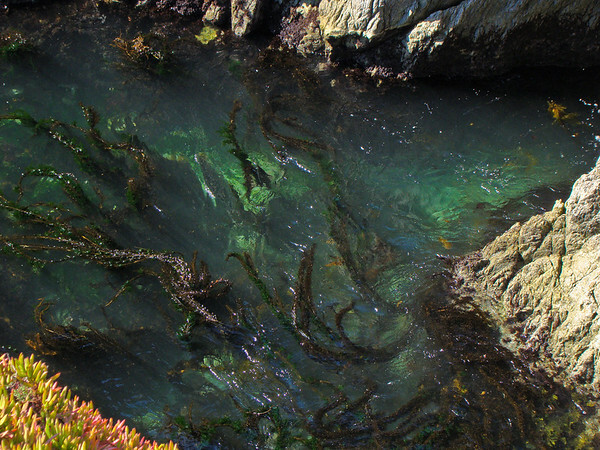 The intense green of the waters in the coves, seen from above, was fascinating, especially combined with the red-brown of the kelp. This is China Cove. I zoomed the Sony H50 out to about a 160mm equiv. to frame just the water, a bit of rock, and a corner of the ever-present invasive, but colorful, ice plant. F4 @ 1/250th @ ISO 100. Programed Auto. In Lightroom I pulled back the highlights with Recovery, which gave the water depth, and accentuated the green highlights. Added Clarity and a little more Vibrance than I normally use, but I was after the visual effect I remembered from being there. This is a close approximation. Sharpen Landscape preset. It is a rather abstract image, more about form, color, and texture than about the actual water and weed, but I think it has impact. One of these days I will make a print of it for the wall. It is from the Point Lobos Gallery.